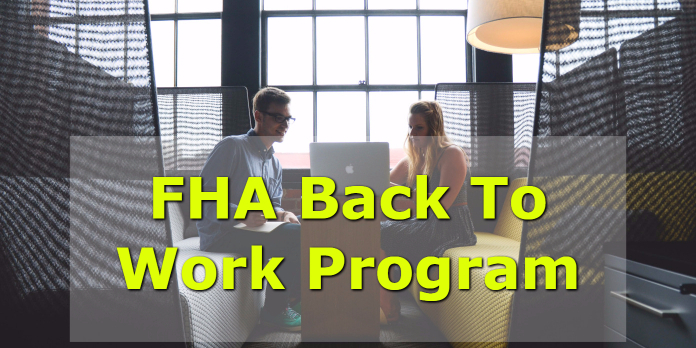 FHA Back To Work Program: Will It Work For Me? If there is one loan program that I have personal experience with, it is the FHA Back To Work Program. When I was going through some hard times and this loan program was introduced, it was the only way for me to purchase a home with such close proximity to my bankruptcy and foreclosure. Now if you are thinking this is just a program for loans after derogatory credit events, you will be mistaken and if you haven’t heard of this program, don’t be shocked since it is not used that often. As we go further into the details and guidelines of this loan program, you will see how particular it is to even get approved, and even if you meet the guidelines, there are still very few lenders who will actually do FHA Back To Work Program. From my experience I got into contact with over 20 lending institutions before I found someone who would take the time to get my loan done. What I can say to everyone is that Loan Consultants can get these deals done for those who qualify. If there is ever a mortgage program that needs to have their guidelines gone over in great detail it is the FHA Back To Work Program because after all, with this program you are able to purchase a home again in as little as 1 year after bankruptcy or foreclosure. Now just because you had one of these events occur doesn’t mean you automatically qualify for this program. This program also requires a manual underwrite to get approved which means an underwriter will go through all your documents manually and they will be responsible with approving this loan. Underwriters will be looking to see that all guidelines have been met and determine the strength of compensating factors in order to get your loan approved. Extenuating Circumstances: The major FHA Back To Work Program guideline that needs to be satisfied is that you need to have experienced extenuating circumstances that caused you to have a bankruptcy or foreclosure. Extenuating circumstances are significant events that happened to your household that was the cause of financial hardships. You are going to need to provide a Letter of Explanation or LOX that states exactly what happened and that it was beyond your control that caused a significant reduction in income. This is normally seen when you or your spouse lose your job which is responsible for at least 25% of the household income. In order for this event to qualify there needs to be at least 6 months of the reduced income that attributed to the bankruptcy and/or foreclosure. You will also have to show evidence of this by ways of your W2s or paystubs so the financial impact can truly be visible. Re-established Credit History: This is another key guideline that will be up to the underwriter to verify in order to ensure you can proceed with the FHA Back To Work Program. Now just because you went through some hard times, you are going to need to show that you are back on your feet and making the proper decisions from a credit standpoint. You need to have 12 month of on time rent payments provided on a VOR or Verification of Rent. This will show that you are up-to-date without delinquencies on your housing payments. This will also make sure that you do not have a 30 day late on your housing payments as well. There will also be evaluating of the current items on your credit report to ensure new credit cards and debt obligations are being paid in a timely manner. Collection and Judgments will also be evaluated to see if you are able to pay these creditors as well. However, it will not be required of you to pay off these collections as standard FHA Guidelines say that they do not need to be paid. FICO Credit Score needed for an FHA Loan with a 3.5% down payment is 580. If you have a 500-579 FICO score you will be required to put 10% down payment as well as show documented compensating factors for obtaining your loan. Debt to Income Ratio will vary depending on the FICO score that you qualify with. If you have a 620 FICO or higher you are able to have a 56.9% DTI Ratio while if you have a FICO below 620, you will be limited to a 43% DTI Ratio. You can see here why it is so important to build up your FICO score as much as possible before buying a home again. You need to make sure you are working with a lender who can get your loan done and that means working with Loan Consultants as we have a talented underwriting staff to go through each case in an efficient way and get you approvals in no time. If you are looking to use the FHA Back To Work Program then you need to make sure you take a Pre-Purchase Counseling course by an accredited HUD agency at least 30 days before you start your new loan. In this counseling you will have a session with a counselor who will go over the cause of your financial hardships and make sure you are making the proper decisions now and as you move forward. This counseling certificate is valid for 6 months so if you took the course today, you would have 5 months to start a new FHA Loan or you will be required to go through the counseling again. Once you begin your application, you need to keep in mind that every loan on that goes through the FHA Back To Work Program goes through a manual underwrite and everyone’s case is evaluated independent of anything else. If you find yourself not working with the proper FHA Back To Work Program lender you can be faced with multiple headaches and stress levels as you try to find a lender who will work with you. You can take my experience with this program and I was at the end of my rope/patience before I finally found a lender who was proficient in the FHA Back To Work Program. This isn’t a difficult program to understand, but it is very particular in how it evaluates your situation to ensure you truly qualify for this program. Keep in mind that you are trying to buy a home after a year from your bankruptcy and/or foreclosure and you need to convince your lender that your hardship was no fault of your own and that the lasting ramifications were for at least 6 months. If you have questions regarding this program and want to work with a professional, please reach out today and we can prevent your FHA Back To Work Program from being a nightmare. I look forward to hearing from you any time at 888-900-1020.